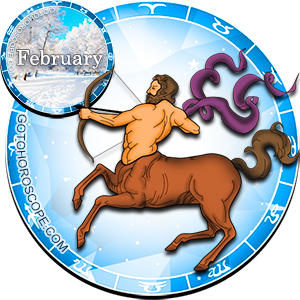 February 2012 Horoscope Sagittarius, free Monthly Horoscope for February 2012 and Sagittarius Astrology Forecast for the month ahead. 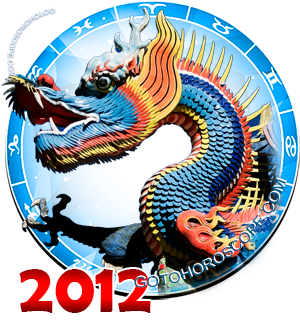 The planetary power moves now from the east sector into the western part with regard to social activities and romance. From the 19th on, it becomes more difficult to change the terms of any situation and you'd be better off trying to go with the flow whenever possible. Do your best to adjust to the given situation, as your own personal power and sense of independence are somewhat weak at the moment. Instead of moving toward great change, try to develop your social graces and learn how better to get along with others. Do not allow yourself to become dependent on others, particularly when it comes to domestic scenarios. However, if you find yourself relying on someone else, at least avoid all selfishness and do your best to get along. Otherwise, you risk alienating friends and family. 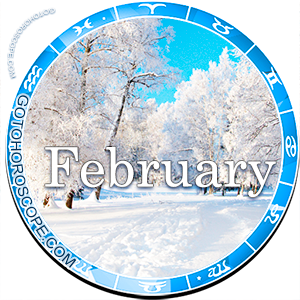 Your intelligence and ability to communicate remain strong this month, at least until the middle of the month when you may find things becoming somewhat more difficult along these lines. This is a good month for promoting any project or activity in which you're involved, either through bulk mailings, email promotions, traditional advertising or other mass communication techniques. Your ability to market your ideas works to your advantage now, especially where finances are concerned. You'll be able to see a great return on your investments provided you are willing to put in the time and effort needed to properly publicize them. When it comes to furthering your education, this is also a good month. You'll find it easy to learn new things and pick up new ideas. Those Sags still in school will find they suddenly have a greater propensity for ingesting and understanding new concepts. Home and family play a very important part in your life now. You will find yourself very involved on the home front and you must set aside time for this. Oddly enough, it is now that you begin to look inside yourself in an effort to understand the clockwork of your mind and emotions, the things that make you "tick." You may discover that your motivations are not as pure as you originally thought they were. You must guard against going "off the deep end" when it comes to your darker self. Your moods and feelings are running a bit rampant now and this is bleeding through into your everyday life. To top it off, it's possible you're facing a difficult decision and having a tough time deciding the right course of action. In the end, you must think carefully about your most cherished beliefs and chart your course based on the things you know to be true. Rest assured, in the end you will take the correct, if more difficult, road. One look at the stars, particularly in the latter half of the month, will send your mind soaring to places your body cannot follow. Your imagination may get the best of you in February, to the point that your daydreaming interferes with your ability to accomplish the tasks at hand. Keep at least some of your attention focused on job and family, the things which matter most. You should also pay close attention to your financial situation. Don't make any major purchases you can easily put off until later. Keep your wallet close to your pocket this month and hold onto whatever nest egg you have for future investments. Great things are coming to you in the financial arena, but not quite yet. Be ready.